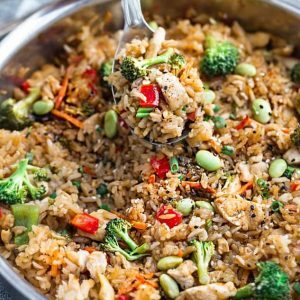 Instant Pot Rice with Teriyaki Chicken and Vegetables has all the flavors of the popular takeout dish and comes together in just one pan in just 30 minutes in the pressure cooker. Best of all, super easy to customize with your favorite veggies. In a medium bowl, whisk together the soy sauce, vinegar, honey, and Mirin. Turn the Instant Pot to SAUTE mode. Heat 1 1/2 tablespoons of sesame or olive oil. When the oil is hot, add the chicken and season with salt and pepper. Saute for 2-3 minutes, until lightly brown. Add the garlic and ginger and cook for another 20 seconds. Pour in half (1/2) of the sauce, the uncooked rice and 1 cup of water. Once the 3 minutes is up and the Instant Pot beeps, allow the pressure cooker to release naturally for 10 minutes. Remove the lid carefully and press the SAUTE button. Add the bell peppers, carrots, broccoli and edamame. Whisk the cornstarch slurry together with the reserved amount of sauce and drizzle in the desired amount into Instant Pot (you can save the rest for a stir-fry next time). Cook until vegetables are tender. Sprinkle with sesame seeds and green onions, if desired. Serve hot. In a large 12" skillet over medium-high heat, add the soy sauce, vinegar, honey, Mirin and starch and whisk to combine. Slowly whisk in water and bring to a boil until thickened. Transfer to a heat safe bowl. Wipe down the same pan with a damp cloth, then heat sesame oil over medium-high heat. Add the chicken and season with salt and pepper. Cook for 2-3 minutes, stirring until lightly browned. Add the ginger and garlic, stirring for 20 seconds, or until fragrant. Add the bell peppers and carrots and saute for another 30 seconds. Stir in 1/3 cup of the sauce, reserving the rest for drizzling at the end. Add the rice and gently stir in 1 1/4 cups water. Cook for 11 minutes, stirring occasionally. Stir in the broccoli and edamame; cover pan and cook for an additional 4-5 minutes, until most of the liquid is absorbed and rice is tender. Remove from heat and drizzle with the desired amount of sauce to taste and consistency desired (you can save the rest for a stir-fry next time) and serve immediately.